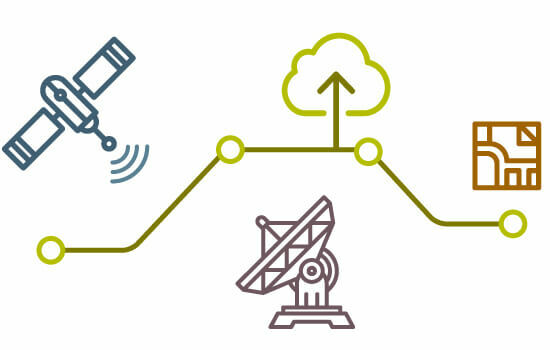 Create operational EO products and services. Learn how to process EO data in real-time on the cloud! Focus on your algorithm only! Sinergise, the company that developed Sentinel-Hub, is a software development company focused on large-scale GIS for agriculture and land administration,with a long track record in cloud GIS. While attempting to get Sentinel-2 data to their customers in Europe, Africa and Asia, they realized that current technologies were not up to the challenge. Transferring the massive amount of data and efficiently processing it into an image, useful to users, would be cumbersome, time-consuming and expensive. Sentinel Hub was born out of the desire to remedy this problem. Sentinel-Hub has hidden the complexity of archiving, processing and distributing satellite imagery behind a set of standard web services which can be easily integrated into any desktop, web or mobile mapping application. During this course you will learn how to leverage the power of Sentinel-Hub platform in order to create your own Earth Observation products!